Wharf Fest returns to San Francisco’s iconic waterfront neighborhood. For the sixth year in a row, Fisherman’s Wharf invites Bay Area locals to come enjoy the neighborhood after the crowds of visitors have subsided but before the fabulous fall weather fades away. Festival goers will enjoy a street fair, art vendors and a variety of free activities. At the most delicious part of the day, the Chowder Competition, 10 different Wharf restaurants will battle it out for the title of the Best Chowder at Fisherman’s Wharf. Wharf Fest, San Francisco’s favorite free waterfront festival, comes back for the sixth year in a row on October 20, 2018. The Fisherman’s Wharf Community Benefit District is throwing the ultimate festival to celebrate San Francisco’s historic waterfront district. Bay Area locals are invited to visit the district after the tourist season has ended and before San Francisco’s fabulous fall climate fades away. This year’s festival will include, for the sixth year, the popular Chowder Competition. Festival goers can visit approximately 50 booths of fine arts and crafts, beverage sampling, and more. Fisherman’s Wharf loves embracing their whacky side and will be hosting a number of free Wharf-centric activities. The festival takes place along the waterfront on the "Little" Embarcadero , between Taylor Street and Powell Street. The festival overlooks the San Francisco Bay, the Pier 43 promenade, and Alcatraz Island. At Wharf Fest’s Chowder Competition, restaurants of Fisherman’s Wharf, California’s chowder capital, will battle it out for the title of Best Chowder at Fisherman’s Wharf. The 2017 winners were Cioppino's, for the Judges’ Choice award, and Fog Harbor Fish House, for the Peoples’ Choice award. 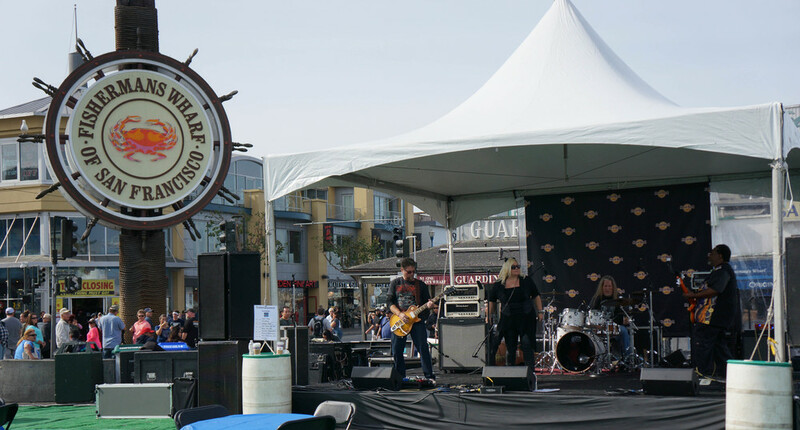 Wharf Fest is hosted by the Fisherman’s Wharf Community Benefit District and produced by Steven Restivo Event Services. To become a Wharf Fest sponsor, click here! To have a booth at Wharf Fest click here! A: Your Chowder Competition ticket will include individual tasting tickets for each restaurant. There are typically 10-12 restaurants that compete. There will be one ticket for each restaurant and a bonus ticket that can be used at any chowder booth. Each ticket will give you a 2 oz. sample of chowder. Some restaurants will offer a bonus chowder flavor for your the tasting ticket. With one Chowder Competition ticket, you can likely expect to receive approximately 14 2oz. chowder samples. 28 oz is equivalent to a very large bowl of chowder and will likely be enough for your lunch. You will also receive a ballot to cast your vote for the Best Chowder at Fisherman's Wharf. The Fisherman’s Wharf Community Benefit District (FWCBD.com), a nonprofit organization, was founded in November of 2005 by the business and property owners of the San Francisco neighborhood. The district is funded through an annual assessment for 15 years from the property owners. The purpose of the Fisherman’s Wharf Community Benefit District is to preserve and enhance its vast San Francisco waterfront landscape and multi-cultural heritage, while integrating modern efficiencies to enrich the experience of visitors from both near and far.